Posted in Bright Ideas / Blog on October 23, 2018. 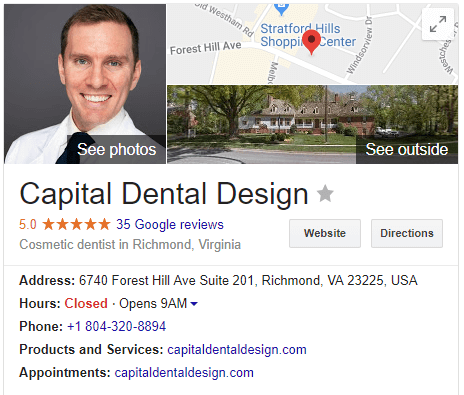 Google My Business is well-known for testing features without fanfare (or even announcement). Anyone working with Google’s business listing product will know the mix of excitement and stress that comes with noticing something new in the interface or the dashboard. In 2018 alone, Google has demonstrated a willingness to improve both the consumer and business experience of Google My Business. They’ve encouraged engagement and interaction with Google My Business Q&As and Google My Business Posts, they’ve helped to generate subjective ‘attributes’ for local businesses, they’ve abandoned anonymous Google Review profiles, and much more. Recently, Google has been testing and potentially rolling out some important features that seek to bring ever more of the search experience from your business website to your GMB profile. Those features are Products and Services URL, Product Collections and Reserve with Google. What is the ‘Products and Services’ URL in Google My Business? The ability to showcase or link to the products you sell and services you offer has long been gestating within Google My Business. An early version of the ‘Products and Services’ link started to appear in a few GMB profiles as early as 2015, and then the ability to add ‘menus’ to your GMB via the API was launched in late 2016 (and in some cases Google decided for itself whereabouts online your menu lived). In April of this year, more people started seeing the option to list and cost ‘Services’ within their accounts. Of course, for Google it seems to be one thing to ask business owners to submit this information via GMB and entirely another to actually display it in any consistent and meaningful way. However, it seems the wait is over as more people are seeing parts of this functionality appear in the Google Knowledge Panel results for their businesses. As first flagged by Andy Simpson a few days ago, Google is showing a URL under ‘Products and Services’ in GMB. In this case, the URL was specified as a ‘Menu URL’ in the GMB dashboard, harking back to those early tests with restaurants in 2015. While it’s not ideal for many businesses who prefer to separate their ‘Products’ and ‘Services’ pages, there’s certainly now a strong impetus to develop a page simply describing every product and service (with costs), and include this as a ‘Menu URL’ under URLs in the GMB back end. No matter your industry, there’s a great opportunity here to grab some of that traffic back from Google. Obviously it’s sales that matter at the end of the day, but another link to your website in GMB is a bonus that’s definitely worth the effort. For consistency, the Products and Services page you’re linking to should closely match what you’ve included in your ‘Services’ descriptions in GMB, and both should be updated at the same time when a service or product (or ‘menu item’) changes. Google will be undoubtedly comparing the content of your given Menu URL with the offerings you describe in GMB. Although we at BrightLocal can’t replicate this Menu URL feature in our own GMB, it’s possible that our business category is having an impact on whether we have the option. This is still very much up for debate, though, so we’d love to see any examples you have of the option appearing within the GMB back end. What are Product Collections in Google My Business? Another new feature (this time with a far less complex history) recently spotted is the ability to put together ‘Product Collections’ via a Products (Beta) tab in the Google My Business dashboard. First pointed out by Local Search Forum member Cordell Crowley, this Product Collection should show up in the Products tab when your GMB is viewed on mobile (yet another feature only visible on mobile – meaning my team think I’ve been on my phone the whole day). 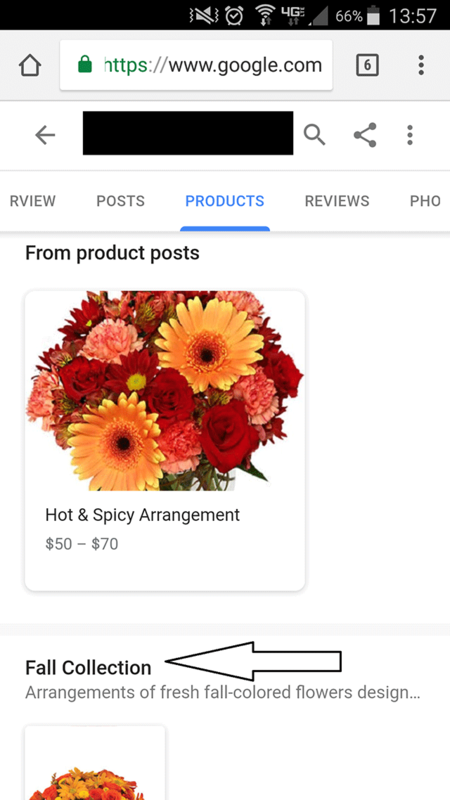 In the screenshot below you can see the Product Collection appear beneath a Product Post (a type of GMB Post that features in the Products tab). One notable aspect is the ability to add images. Businesses taking advantage of this would do well to examine how these images are displayed in mobile GMB profiles and create clear and consistent branding for each collection, perhaps with similar backgrounds or graphics. Although floristry is the example uncovered, I can see this working well for clothes stores, gift shops, and in fact any business that has the option available and can think of creative ways to use it. Unlike the aforementioned Products and Services URL, though, these collections and product previews cannot include links to the relevant product pages. Even though I would argue that this would be the ‘natural’ way for a searcher to expect the Product Collections showcase to work, it’s clear that forcing searchers to click elsewhere (ideally, ‘Call’ or ‘Website’) is part of Google’s strategy to bring the first point of content into GMB, thus boosting its perceived benefit. Google My Business really is turning into an online shop window for your business. Combined with the aforementioned updates to Products and Services, GMB really is turning into an online shop window for your business. Once this feature is fully rolls out, searchers will have an immense amount of information at their fingertips on GMB, significantly reducing the need to visit your website. I expect to see crossover with Google Shopping very soon. What is ‘Reserve with Google’ in Google My Business? In 2015, Google started to test booking appointments through GMB, which soon became part of ‘Reserve with Google’, an initiative bringing together appointment-booking and reservation apps (not available in all countries) such as Bookatable and SalonRunner, and integrating them into the GMB user interface. 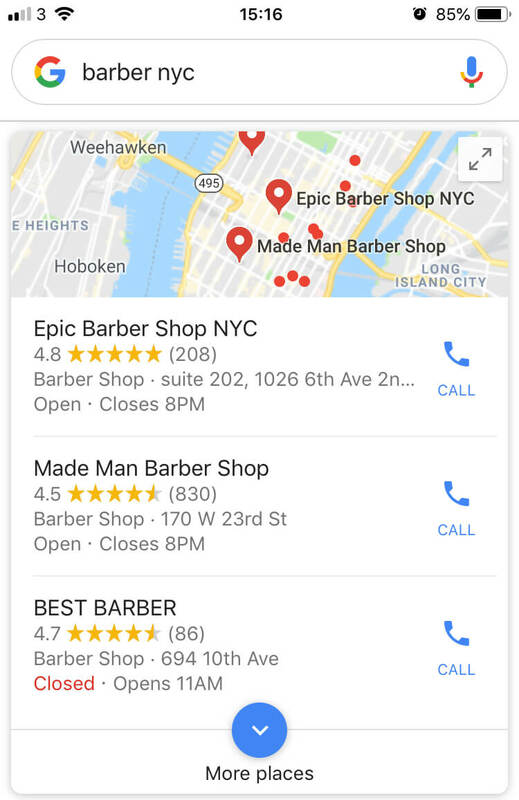 It looks like this is rolling more widely, with Barry Schwartz reporting in Search Engine Land that it’s been seen used in a search for ‘barbers nyc’. I could replicate this on my mobile phone, but it’s worth noting that your choice of browser affects whether this integration appears. 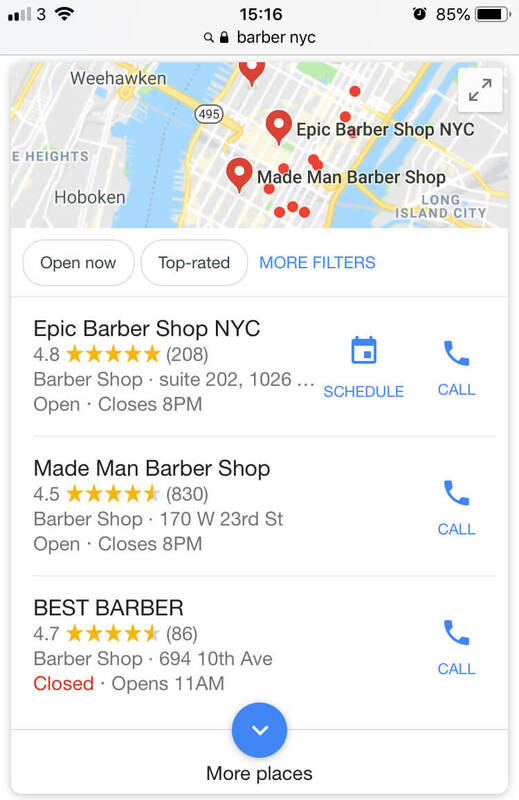 For example, here’s what the listing Barry mentioned (Epic Barber Shop NYC) looked like when I searched for it using Safari on an iPhone. It seems odd to omit a feature like this on Google’s own browser. My hunch is that Google wants to funnel its app users into calling the business so that they can claim attribution for any purchases (e.g. customer came from a call made from the Google local pack, found using the Google app) but I might be completely wrong. It might be just an issue of spacing and how much each browser allows for local pack results. Let me know in the comments if you have any idea why this browser disparity might be occurring! Browser madness notwithstanding, this is a really interesting integration rollout from Google, and one that should technically be very easy to implement, as the integration simply pulls from whichever reservation service you’re already using on your site. Any business with an appointment calendar should be able to encourage bookings directly through GMB. Of course, the available applications are currently limited by the number and variety of reservation services that Reserve with Google integrates with (36 at the time of publication, with 33 labeled as ‘Coming Soon’), and the focus at present seems to be on food and health/beauty, but theoretically any business that has an appointment calendar should be able to encourage bookings directly through Google Local on mobile. 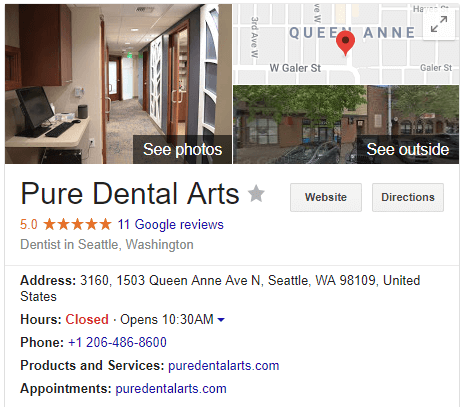 One thing I would add before closing is that Reserve with Google links up nicely with what’s in the GMB Services tab, namely that when you click on a particular service in this tab, you’re taken to a pre-filled appointment-booking calendar. This is the same calendar you’d see after clicking ‘Schedule’ or ‘Book’ but with the appointment type already filled with whatever you clicked on in Services. This kind of interlinking between parts of the mobile GMB experience (where a lot of the user-facing updates have been found lately) reinforces my belief that Google is developing GMB into a highly sophisticated storefront that aims to keep traffic off your actual website but provides value in many other ways. Only Google will decide where, how, or even if information is displayed. What these updates and tests tell us is that Google wants to keep you entering more information and images into your Google My Business account, but only Google itself will decide, based on your business type and various other unknown factors, where, how or even if that information is displayed. My advice would be to make it a habit of jumping headfirst into every new GMB feature, and filling out your GMB profile with as much information as you can, because the day will undoubtedly come that this information appears on your GMB listing.